Popularly known as “Pumpkin Toadlet” Brachycephalus ephippium is a small anuran amphibian belonging to the Brachycephalidae family, with a yellowish color, sometimes half orange, that lives in the litter of the Atlantic Forest, in the states of Bahia, Espirito Santo, Rio de Janeiro, São Paulo and Minas Gerais of Brasil. It is a graceful, slow-moving animal that walks by day on the forest ground, especially when the ground is wet after some rain, looking for food. As soon as he perceives the approach of some danger, as people walking the trail, hides under the fallen leaf to the ground. And so many individuals end up being overwhelmed by people. It was the first species described for the genus. Today there are several species in this genus, but B.ephippium remains the most known species of them from the general public. Its biology was for a long time unknown, suspecting that it reproduced directly in the ground, without the larval phase (Duellman, 1986). In the 1990s, biologist Elio Gouveia investigated the effects of their poison on animal organisms that accidentally predated it (com.pess.). A work that seems unpublished. And the biologist Pombal Junior published in 1999 a work affirming that in November of 1990 he witnessed in the field oviposition of this species, and in a controlled environment he observed and described the stage of hatching and growth of the puppies (POMBAL, 1999) and in another work reports that the eggs are placed under the foliage (POMBAL, 2003), but there is no reference in ovoposition in a hole in the ravine. Other works on the subject of reproduction of the species are unknown. For this reason I found it important to report what I witnessed about its reproduction in nature, with the species in its natural habitat, without any interference, as follows. 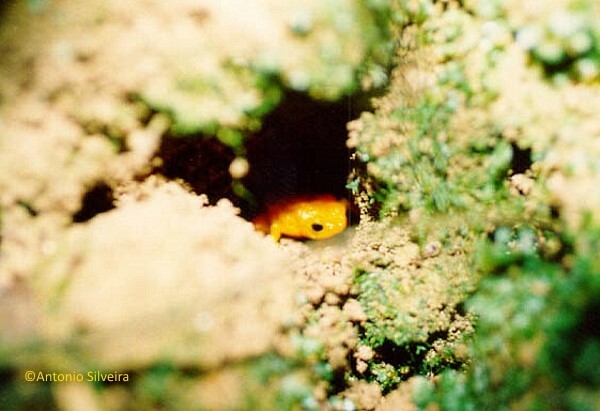 On March 03, 1992, one morning, around 10 o’clock, I and my wife, Gianine Luiza, were making observations of the fauna in the Itatiaia-RJ NP, in the lower part (around 900m / alt. ), more exactly in the forested area of ​​the Hotel Donati, when we saw one Brachycephalus ephippium female in a small hole in the side of the trail, inside the forest, laying eggs. It had her head out of the hole and began to spin, placing the eggs that were small and round like “sago balls”, and with her hindlegs roll the eggs and covering each one with soil particles as soon as it was expelled (photo 1). I counted a 4 or 5, I do not know if I had put more before. Another individual standing by, perhaps the male, stood out of the hole at the top of the hole and put one of the front foot on the female’s back while it spun. It looked like he was looking and helping (photo 2). We did not see how or if he fertilized the eggs, for he got into the hole a bit, but he could not see what he was doing. I was ecstatic and there was no camcorder, just a simple camera with which I ended up taking two photos (below). At that time, as previously said, it was suspected that this species laid eggs on teh ground were born straight, with no larval stage. Nor had any work on the subject been published, not even from the citeds authors. Recalling that the Internet was not yet available for consultation. No doubt it was very exciting to have witnessed the oviposition of Brachycephalus ephippium in the Itatiaia National Park-RJ, and even more because it was perhaps one of the first peoples to see its reproduction in nature. In fact, it was my wife who first viewed the female in the hole, and then she called me. I told this fact to some friends, among them the scientists Elio Golveia and Pombal Junior, but because it is a very rare behavior to be witnessed, and although I did not make adequate documentation, I decided now, after so many years, to write this simple note of what I have seen it, because I think this report can help those who study this species, and possibly other species of this genus. DUELLMAN, W.E. & L. TRUEB. 1986. Biology of amphibians. New York, McGrawHill, 670p. Pombal, J. P. Jr., Sazima, I., and Haddad, C.F.B. (1994). 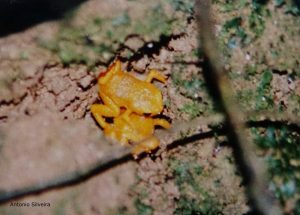 Breeding behavior of the Pumpkin Toadlet, Brachycephalus ephippium (Brachycephalidae). Journal of Herpetology, 28, 516-519. Pombal, J.P., Jr. (2003). “Pumpkin toadlet, Brachycephalus ephippium.” Grzimek’s Animal Life Encyclopedia, Volume 6, Amphibians. 2nd edition. M. Hutchins, W. E. Duellman, and N. Schlager, eds., Gale Group, Farmington Hills, Michigan. (I used Google Tradutor to the portuguese to english). Photo 2 – couple at the moment of the oviposition. Male outside the hole with the right front paw on the female’s shore as she laid the eggs one by one and rolled them rolling and covering with the ground.